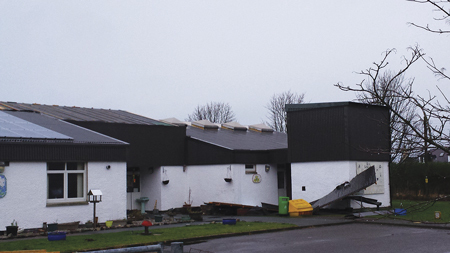 A huge section of roof was torn from Kyleakin Primary School on Skye at the height of last week’s storm. The 25 pupils are now attending Kyle Primary School, which due to a falling roll has spare classroom capacity. A spokeswoman for the council said: “Kyleakin School is closed due to storm damage and will remain closed until repairs have been carried out and the building made safe. Arrangements have been put in place for pupils to be transported to Kyle Primary. “School transport will collect children at Kyleakin village hall and deliver them to the same location, at the end of the day. There has been extensive damage to the large sections of the roof. The building is currently wind and water tight, on a temporary basis, to avoid further damage. Michael Russell, chairman of Kyleakin Primary School’s Parent Council, added: “I hope our local school re-opens as soon as possible. Sometimes, temporary arrange­ments can become permanent, and, given the cost-pressures on the council, they might be tempted to merge the schools, with Kyle as the preferred option.